The iPhone 6 and 6 Plus, as well as the latest iPad Air 2, garner all of the attention for being Apple’s flagship devices today, and rightly so in all honesty. But what about those individuals who prefer to keep things old school and still regularly use an iPhone 4s or a second-generation iPad? Thankfully, a jailbreak developer has decided to show a little love to the aforementioned older hardware by releasing a small utility that allows those with semi-vintage devices to be downgraded to run an older version of iOS. There was a time when discussing the ability to downgrade an iOS device to an earlier version of the mobile operating system was a much talked about process. In fact, it was almost as popular a topic as the art of jailbreaking itself. Of course, downgrading more often than not required SHSH blobs to be saved for the device, which in turn meant that the user had to do a little manual labor to ensure the success of the process before Apple stopped officially signing the older firmware. This latest tool, named OdysseusOTA, makes downgrading those devices to iOS 6.1.3 possible without the need for stored SHSH blobs, which means you don’t even need to tinker around with a utility such as TinyUmbrella to make the magic happen. 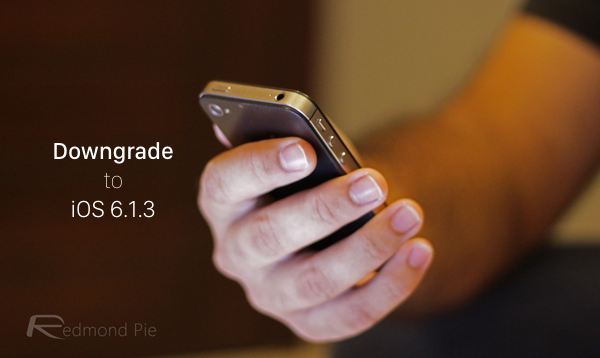 Why downgrade to 6.1.3 from iOS 7 or 8? Performance. As you might already know, iOS 7 and iOS 8 makes these older-gen devices very slow and sluggish to use. If the lack of performance bothers you a lot, this tool might just help. This tool will only work on devices that support iOS 5.0.1. This means that only the iPad 2 and the iPhone 4S is supported. It doesn’t matter if your device came with iOS 5.1+ as long as you have a device that can support iOS 5.0.1 you are good. Why? Because Apple made a mistake in their code and devices that are on iOS 5.0.1 MUST update to iOS 6.1.3 (if they are updating via OTA) in order for their deceive to be able to update (again) to latest iOS version. Of course, to be able to take advantage of this, the device in question you would need to be jailbroken already and then downgrade using OdysseusOTA tool. Not only will the downgrade process provide a smoother, more pleasurable experience that seemed to be robbed from these legacy devices by the introduction of iOS 7.x, but it’s also possible to jailbreak using the P0sixpwn tool on 6.1.3 once downgraded. Although OdysseusOTA is a brilliant little tool to bring back the good old skeuomorphic days of iOS 6, it’s worth remembering that a lot of App Store apps and Cydia extensions have long since removed compatibility with this particular firmware. site you can find on the internet nowadays. loading into recovery mode., any advice to fix that? Everybody! I do believe the greatestiphone ՍΝᏞΟᏟΚing service on the web is just google atttiphoneeuunloockiing. we are in a job to սոⅼοсking the phones which was bared or bl0cked with the carrier. is it possible to downgrade an ipad mini 1st gen? I was forced to upgrade from iOS 5.1.1 to 7.x just to get a few of my apps updated. Everything is so slow it’s ridiculous. Whoever at Apple thought it’s a good idea to force iPhone 4 users to upgrade to iOS 7 should be fired. It’s reasons like this I’ll never be upgrading to another Apple device. I’m glad there’s now a way to downgrade to iOS 6 to make my phone usable again. I would suggest to restore to latest and jailbreak again and then try it again. Did it work for iPhone 4 at the end?